Induction cooktops generate a magnetic field at a few tens of kilohertz (kHz) which heat an iron or stainless steel pan through magnetic induction. The exact frequency used may vary depending on the pan size or element used, in order that the cooktop works most efficiently. The magnetic field is largely confined to the pan, but does extend beyond it. However, the strength of the field always decreases rapidly with increasing distance from the cooktop. 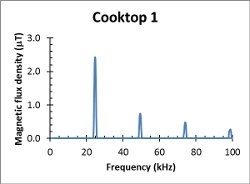 Magnetic field measurements on three induction cooktops, made at the edge of the bench in which the cooktop was mounted, are summarised in the table below. The highest field was always found with the pan on one of the front elements or cooking zones, and the element control on “Boost”. Normally fields were less than half of the maximum value. The table shows the operating frequency, the highest magnetic field measured in microtesla (μT), and the magnetic field as a percentage of the exposure limit recommended by the New Zealand Ministry of Health*. 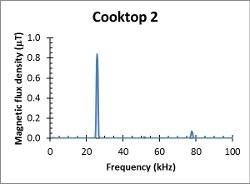 Below are plots of the magnetic field spectra for the three cooktops. These were not necessarily taken when the magnetic field was at its highest level. * The Ministry recommends using exposure Guidelines published by the International Commission on Non-ionising Radiation Protection (ICNIRP) in 2010. ICNIRP is a scientific body recognised by the WHO for its expertise in this area. 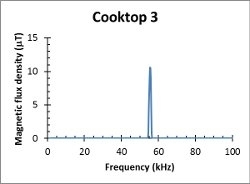 At the frequencies used by induction cooktops the public limit is 27.5 microtesla.